BMW is a brand that has been in the business of manufacturing luxurious cars for almost 100 years and is regarded as one of the “German Big 3”. BMW M Series was launched to offer an all exclusive package of style and comfort to its esteemed customers, who can rely on the utmost stable aerodynamic exterior design. BMW M4 Coupe is one amongst the M series and offers fascinating performance on roads with its speed, comfort and elegant style.BMW M4 Coupe comes with a twin power turbo engine that gives it the strength to conquer roads with extremely scalable performance; which offers the riders with a thrilling experience. To save this efficiently engineered specimen from gaining excess mass, most of its components are made from carbon fibre. The explosive performance of this vehicle is unmatched with many of its counterpart models. M4 Coupe has aremarkable exterior design, embraced with stylish interiors from within. When designing the new M4 Coupe, BMW focused its attention on making the car as aerodynamically efficient as possible. Being aerodynamically efficient means that BMW designed the M4 to keep drag as low as possible and to create as much downforce as it could within the design constraints. The latter of these two is where BMW had to be very creative in how it designed every component.Up front, BMW took its first few steps in making the M4 aerodynamically efficient by forming the front apron and air breather for efficient cooling of both the engine and the brakes, and to reduce lift on the front axle. Also present on the front end are the new twin headlights with optional LED technology, and a power-dome hood — a clear sign of the M TwinPower Turbo engine hidden beneath it. handling. Along with the high-tech roof, are the aluminum front fenders and hood. 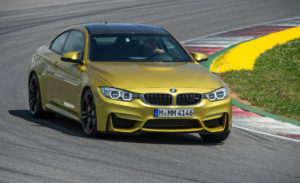 These lightweight components on the front end also help reduce the front-axle weight of the M4, bringing it closer to the optimal 50:50 weight distribution.At the rear the M4 is equipped with an integrated rear spoiler made from carbon-fiber-reinforced plastic and a redesigned trunk lid for even more downforce. Rounding ourt the M4’s styling are flared rear wheel arches and a new exhaust system with high-gloss polished twin tailpipes.Overall, the entire car was designed with intelligent, lightweight features — some in the drivetrain and some in the suspension system, which we will touch on later — that help drop its curb weight to just 3,300 pounds weight, which is about 176 pounds lighter than the M3 Coupe with the same equipment. The distinctive M Sport tricolours are widely in evidence, from the stitching on the steering wheel to badges on the dials and door-sills, but it’s the seats that are the biggest difference between the M4 and 4 Series.The M4’s seats are electronically adjustable and heated as standard, they offer masses of lateral support and drop very low to the floor if you so wish. Tall drivers may want for slightly longer under-thigh support, but otherwise the M4’s leather seats are really good. The only small gripe a driver might have is with the offset pedals on manual versions – they are slightly to the right of the wheel and force you to sit at an awkward angle. The Competition Pack doesn’t add much inside, save for a pair of lightweight sports seats. These are not of the unyielding bucket sort, but rather a spot-on compromise between comfort and supportiveness.Otherwise, sitting behind the M4’s steering wheel is near-identical to the experience in a standard 4 Series, which is no bad thing. It means you get a classy, easy-to-use dashboard, and the M4 is heaving with kit. This includes BMW’s Professional Media package, which includes a widescreen sat-nav and all-round parking sensors as standard. Indeed, BMW’s standard iDrive infotainment system continues to be one of the best available anywhere. Its colour screen and rotary dial controller require no fumbling around and prodding a screen on the move, and its menu structure is extremely easy to follow and memorise. While we got to drive the M4 only at the Buddh International Circuit, we weren’t necessarily complaining. That’s got to do with how much fun the M4 is to drive. The M4’s 425bhp engine may develop slightly more power than the older M3’s naturally aspirated V8, but it’s the bump up in torque (courtesy the turbos) to 56kgm that is most evident. There’s a strong push from very low in the rev range which is something that comes handy when blasting out of slow corners such as Turn 3 at the BIC. On the straights, the M4 will impress with the way it picks up speed. It’s undoubtedly fast but you’d also wish the engine revved a bit more. Sure, the M4’s 7600rpm rev limit is high for a turbo car but given that M3s are known for their highly strung engines, it’s a bit of a downer. Also, the exhaust note, though bassy and rich, lacks a bit in drama. Another point to note here is that the transition from one ratio to the next on the sportiest setting of the seven-speed dual-clutch gearbox is not particularly smooth. Fast? Yes. Imperceptible? No. All said, these are things you’d happily live with once you experience how the M4 drives around a race track. With the dampers and steering set to their most aggressive settings, the M4 will win you over for how decisively it changes direction. The car does exactly what you want it to do – there’s no roll, no inertia and no delay between orders at the steering being executed by the front wheels. On a sequence of bends, the M4 will simply keep you hooked. Pity we didn’t have an opportunity to test the leniency of the active rear differential. Because with so much torque channeled to the rear wheels, the M4 seems like a car that would be happy to break traction at your command. The M4 drives a lot like a sports car. It accelerates with potency, turns sharply and stops quickly. There’s little reason to crave more performance, though the steering doesn’t communicate much road feel to the driver. Still, this is a car that does an impressive number of things very well.The turbo 3.0-liter inline-six feels eager, alert and powerful. Sharp at low revs, has a strong midrange and is willing to rev with great throttle response at any speed. The M4’s brake pedal is firm. The powerful (optional) carbon-ceramic brakes on our test car have excellent modulation and great stopping power. There are some groans at low speeds but that’s expected. In a simulated-panic stop from 60 mph to zero, the M4 took just 106 feet, an excellent result.Steering on the M4 is well-weighted and precise, but it’s lacking the feel we expect from cars in this class. That lack of feel becomes even more pronounced when you get closer to the car’s elevated handling limits, but in-town steering should be sufficient for most drivers.No surprises here: The M4 has lots of grip and excellent agility. The car’s immense handling capabilities inspire plenty of confidence while you’re driving fast. This is especially rewarding for drivers who are attentive in managing weight transfer. We measured an impressive 0.98g around our skidpad.This car is a great example of cohesive integration of the primary driving controls. The manual gearbox in our test car had slick, bright and fast shifts. Drive this car every day and you’ll be able to tell that its nuances were fussed over. The BMW M Series M4 Coupe fulfills all its adamant expectations. It allows its driver to roast the streets with speed and sophistication, but at the same time, grips him with the firmest of safety during his drive. This car goes ahead of all others in terms of safety, equipped with technologically advanced elements seen in few others. It has an intelligence maintenance system specially designed for BMW that strives to deliver safety beyond conventional means. Anti lock braking system with brake assist, along with cornering brake control and dynamic stability control polish the car’s handling to its finest. The high speed machine has side impact protection for crisis situations, along with crash sensors and dynamic braking lights. Three point seat belts protect all passengers, with pyrotechnic belt tensioners and belt force limiters at the front. Airbags on all sides shield its passengers. A warning triangle with first aid kit along with a childproof lock give this car the firmest guard against mishaps. Quite simply there is no weak point with the BMW M4. Prodigious performance – and noise – from that twin-turbo six-cylinder, a ridiculously good chassis, astonishing driving technology for enthusiasts and to-die-for looks inside and out – the team in Munich has missed nothing.Every M3 has traditionally been a contender to be the best-of-the-best in its era. That’s right about the M4 too, each old one was a world-beater and the which replaces the M4 coupe and the Cabriolet worldwide, just about sticks to this tradition without sweat.